Opened in 2004, Citizens Bank Park replaced Veterans Stadium as the home of the Philadelphia Phillies of Major League Baseball. It is one of the three stadiums in the South Philadelphia Sports Complex, and is the second largest by capacity. 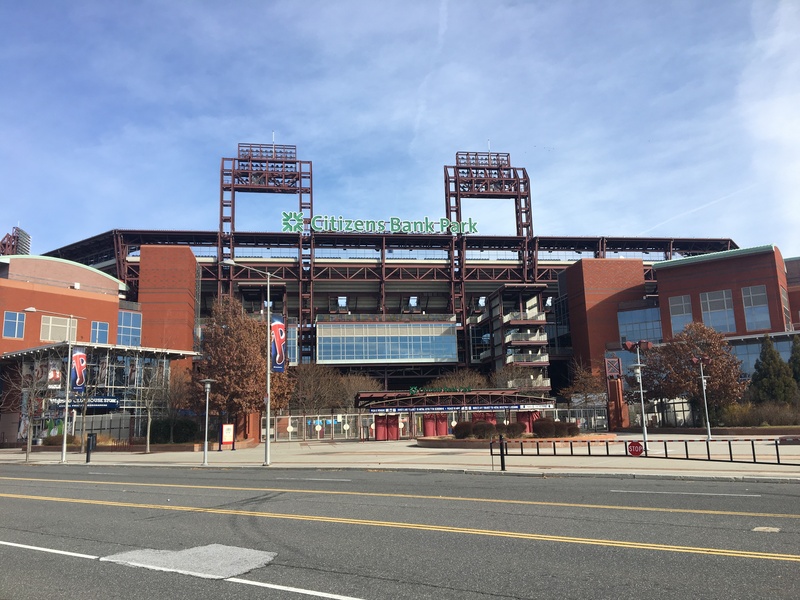 In its ten-year history, it has already been the site of a Phillies World Series victory in 2008, a postseason no-hitter, and several personal milestones. It has over 43,000 seats and 3 tiers of seating, wrapping around the field. Like any other stadium, tickets in the lower level, especially behind home plate, are more expensive than the others, but they do increase your odds of catching a foul ball. For those who can afford really expensive tickets, there’s the Hall of Fame Club in the 200 level, behind home plate, which is full of Phillies memorabilia. The main scoreboard is in left field, with the score, lineups, stats, etc. There’s an out-of-town scoreboard in right field, with the other MLB games occurring at the time. The Bank can be entered through gates at left field, 3rd base, 1st base, and right field (but no one ever uses that one). There is moderate security before entering the park, which would entail putting your stuff in a little box that they put through a metal detector and what not. Once you get inside, the Bank has a variety of eating options, including your classic ballpark foods like hot dogs, beer, burgers, and all that great American stuff. Harry the K’s, named after Phillies broadcaster Harry Kalas (whose statue can be found nearby), is a bar and grille under the scoreboard in left field. Bull’s BBQ, named after Greg “the Bull” Luzinski, can be found in right field. Other Philly favorites, including Rita’s water ice, Chickie’s and Pete’s, and Tony Luke’s are also present here. There are several statues around the ballpark, honoring Phillies greats and figures. Richie Ashburn is in Ashburn Alley, behind the center field wall. Robin Roberts, one of the two Phillies to pitch a perfect game (Roy Halladay is the other), stands outside the first base gate. Mike Schmidt, all time Phillies home run leader, is outside third base, where he played in his career, 1972-1989, entirely with the Phillies. Steve Carlton, also known simply as “Lefty,” is outside the left field gate. Under the scoreboard in right field is longtime broadcaster Harry Kalas, who died suddenly in the broadcast booth at Nationals Park before a game in 2009. The Phillies play in the National League East division of Major League Baseball, alongside the Atlanta Braves, Miami Marlins, New York Mets, and Washington Nationals. Unlike the other teams, tickets are not particularly harder to get when any one of those four teams are in town. Generally, the Phillies’ main rival is the New York Mets, although that will vary depending on the quality of the teams. When both teams are good, games between the Phillies and the Mets are extremely competitive, and fans – both home fans and visitors from New York – are known for being obnoxious. In the past, the Phillies main rival was the Pittsburgh Pirates, currently in the National League Central division. And, of course, there’s the Phillie Phanatic, one of, if not the, most recognizable mascot in professional sports. The Phanatic comes out usually twice a game between innings, usually with his ATV. He can also be seen around the park during games, and on the field before games. You can also take a tour of the Bank, which much be booked in advance.